There are two main reasons I disliked Embracing Obscurity . #1 - The author didn't sign his name. #2 - What he proposes in this book isn't actually possible. As to point number one, the argument Nameless Author makes for failing to put his name to his work is that he is living out for us the example the idea of embracing obscurity. He wishes God to have all of the glory for whatever this work produces and so he's keeping his name out of it. Which is stupid, really, partly because of point #2. Not only would I say that it is thoughtless not to sign his name, but it is also dangerous for him not to own his work on the off chance that he might say something that is theologically unsound. If he is not taking responsibility for his words but is living out some skewed brand of Christianity unbeknownst to anyone around him (particularly those in spiritual authority over him) then how will they know to address him? God gave him a name and a personality that is meant to be known and trying to hide it smacks of ill-intent. There is really no way around it - anonymous words which are presented in such a way to instruct people to change something about their thoughts, belief systems and lives should be looked upon with a fair amount of suspicion. I, for one, find security in knowing who penned what book. If a book says that it was written by Rob Bell, I know that it's probably a good idea that I not read it. If it says R.C. Sproul, I'll have a listen. Names matter because theology matters. I have no idea what Anonymous believes and I wouldn't accept instruction from an anonymous person. This fact alone made me incredibly distrustful through the entire read. I never could relax because I wasn't sure what Anonymous was going to say next and since he contradicted himself so thoroughly and constantly (as he couldn't help but do so because, once again, what he proposes is actually impossible) it was just like finding a note in your mailbox which reads, "I liked that red sweater you wore last Thursday when you went to the park." Spooky. And what is the intent!??! Then, there is the fact that by cloaking himself in anonymity, he's doing himself and his family a disservice because there are some theological issues with this book and now there is no one to address them to. Moving on to point number two . . . In the first half of the book Anon is arguing that we're a prideful people who want to be known but are supposed to be following the example of Christ by living a life of obscurity. (What I think he means is, "We are more prideful than not and need to practice some humility." But he uses the word "obscurity" and so his whole book doesn't work.) To explain/argue his point, he uses scriptures in which he names people that God named and did not leave obscure. He name drops "Moses", "Joseph", "Saul/Paul", "Mary", "Joseph" and Jesus. At various points in the book he argues that Jesus himself led an obscure life and so that's what we're supposed to do. Here's the problem: we were created in the image of God. We are not gods (and never will or can be) but we were made in His image. He told us to go forth and take dominion of the Earth. We create because He created. We beautify because He beautified. He named Adam, Adam named all of the animals and gave a name - and meaning - to Eve. Every name you are told in scripture was given with purpose and meaning. Each individual was given a story. Each individual is designed to be part of a whole - the Body of Christ. We're all different, with our own gifts and talents - but we're all together working for the glory of God. The only way you could be obscure is to be invisible. But we aren't. I have reddish hair and you have black. My skin is fair. Yours might be dark. People have loud laughs and quiet ways of giving hugs and ministering to others. Some people have freckles and the ability to patiently teach others. While still others have the ability to encourage and persuade others to change. Anon argues that "some people are giving spheres of influence" and if they are given such a thing then they need to be humble about the way they influence others. Before you begin to fear that you might be an elite person of influence, who will have to wrestle with vast amounts of pride, let me proceed to freak you out thoroughly and entirely. We ALL have spheres of influence. Everyone is necessary. The reason you are on this earth is because you are necessary and because God has a plan for you - like it or not, know it or not. It's this inescapable fact. It is impossible to be obscure. Trying to be obscure is like trying to build a magnificent and great castle with tiny pebbles. In other words, it's well nigh impossible! One of the problems which exists for this book is that its readers have names. They have a purpose, as Anon was compelled to admit (which was smart of him, really. Kudos.). Yes, pride is a problem. We are supposed to be living for the glory of God. But to say, "The only way I can live for the glory of God alone is if no one knows who I am or what I'm doing" is ridiculous. Martin Luther had a name. Did he do wrong signing it? I know who Corrie Ten Boom is. Do you? Whoops! Having a name and a known story is not bad. Let's don't get into the habit of saying that it is. Is worrying that you won't have the same type of story as Corrie bad? Probably, yes. Do you really want her story? I don't. But her story encourages and influences me. Just like some of you encourage and influence me. And I'm glad that you do. I'm in your sphere. Hi. But if we are supposed to imitate our Lord and Savior then we are compelled by force to admit that Jesus has a name (which is why we do). Does He continue to do wrong by letting us know what it is? To imitate Christ does not by any definition mean that we need to go stealth? I suggest not. Do we need to deal with pride and love of self? Yes. Do we need to die to self and do the will of God, even when we don't like what it is? Yes we do. But we can keep our names, take comfort in the fact that we exist on this planet because God wanted us to and because He has a design for us (whether we see it or not or acknowledge it or not). There is no reason to hurl the baby out the window while we're emptying out the bathwater. If you feel that you are dealing with pride - pray about it. Understand that you were made for God's glory. Understand that you have a sphere of influence no matter who you are or where you are. Serve others when you feel called and as you feel called. (But do know that you were called to serve others.) Do not waste time comparing yourself and your life with others. Your story is your own. Theirs belongs to them. Examine yourself in light of scripture and shun evil. When you do these things, as Anon points out, people WILL know you are. Because. you. can't. be. obscure. So no need to worry about embracing such a thing. Here's another review of Embracing Obscurity (that I thought was funny) but that also takes issues with the way Anon used scriptures to "make a point" (which he ultimately failed to make). I'm with these reviewers - I wouldn't and couldn't recommend this book to anyone. 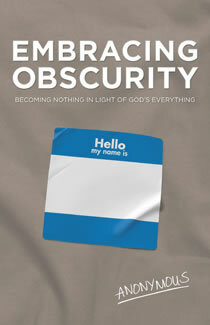 I was sent a copy of Embracing Obscurity by The A Group in exchange for my honest opinion. There you have it. I do that with reviews, too -- try not to read them til I have written mine. I don't think I actually even look for them unless I have trouble or an issue with the book and wonder if it's just me or if others felt the same way (unless someone I know had reviewed it -- then I look for theirs just to compare notes after writing mine). This books sounds like such an example of an author getting off balance. Pride and self-promotion are problems, but the answer isn't embracing obscurity. Moses was called out of obscurity to stand before Pharaoh and lead Israel out of Egypt -- a job he didn't want at first. David was called out of the obscurity of shepherding to be king of Israel. Too bad the guy didn't check out his theory thoroughly in Scripture. He would have done better to study out what the Bible has to say about pride and humility rather than coming up with his own flawed solution. Well, I have no interest in reading the book, but I *did* appreciate your reasoned review. Thanks for taking the time to explain your thoughts on it. Thank you for thorough thoughts on why obscurity is not the answer. PS. I think blogging is esp important to NOT be obscure for the same reasons! I am intrigued both by the book concept and your response to it. We shouldn't--ever--relax while reading a book and assume that someone is going to be preaching the truth. All of us are subject to error. The name branding that causes people to relax--"Ah, this is so-and-so, so you know it's good"--is exactly what we are most in danger from. And we can find flashes of truth in surprising places. My faith was preserved at one difficult point by a fantasy book written by an agnostic. I love the Medieval ideal that the work is everything and the person nothing. The people toiling in obscurity to build a cathedral--not because they flashily chose obscurity, but simply because it wasn't the point who did the work, but that the work was done well. Even with books the book should be judged by what is in it, not by the persona of the person who wrote it. All that said, it doesn't sound like this book was particularly well-written or convincing. I don't know that we should deliberately choose obscurity--as we can see, God did sometimes call people to prominent positions--as that fame, notoriety, a name and a following are simply not appropriate goals. If we work in obscurity, our work is no less valuable for that. Thanks for your well-thought out review. Definitely a good I'll be skipping! Interesting. I don't like anonymous authors. It's difficult to hold them responsible for their words. In this case it comes across to me as a kind of false humility. @Stephanie - Exactly. Which I think is the incredible danger of reading and attempting to "do" this book. It can only result in false humility. Which is a different sort of pride all together. I like Carrots' well deserved warning that there are no "safe" authors. Even the Apostle Paul commended those who refused to automatically believe him, but checked his teachings out. We would do well to do that with everything we read. Stephanie's point about false humility is well taken too. My observation about any and all formulas (including this one) is that they lead those good a checking boxes to false humility - and disdain of others, and to frustration by those who are not so good at it. Carrie, if you begin reading on a Kindle you will break my heart! Marking in books is acceptable. I do this constantly. This seems like one to skip. But this had me cracking up: "I liked that red sweater you wore last Thursday when you went to the park." Spooky. Really good review and you make great points! I imagine the author's goal was to talk about the cult of celebrity that we, as Christians, being human, keep creating. We have our Christian celebrities and we tend to follow them and be "of Paul" or "of Apollos." It's a problem, but it doesn't sound like this guy has come up with the solution, which is, of course, to simply follow Christ.